When one of NZ's most iconic brands came to us for to overhaul their website, we jumped at the chance. We literally jumped - off a very high platform, attached to a rubber band, to get that job. May our commitment to our clients never be questioned again. Given that the experience was hand-to-heart one of the most awesome things we've ever done, their old site just didn't capture it. 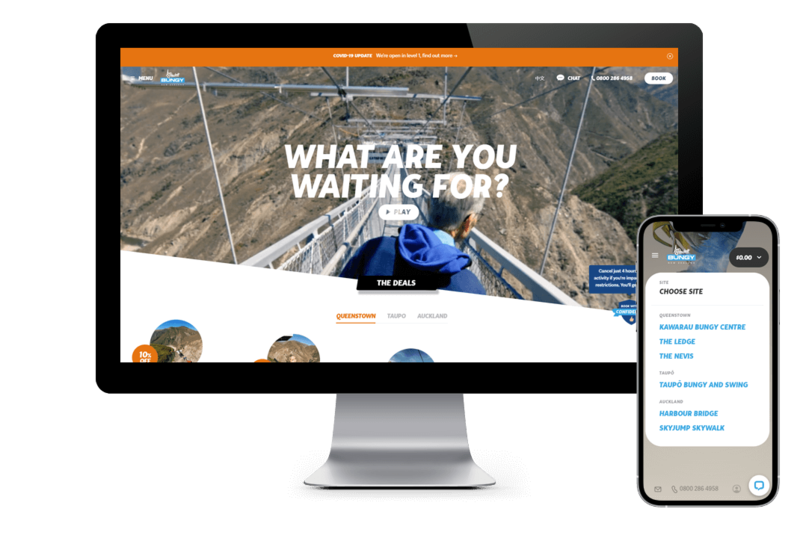 Our brief was to create a modern, exciting site that showcased the Bungy experience, and translated into revenue. Despite their old site looking like it was designed in 1974, it was still their best performing sales channel, with big money running through the site annually. Even the steely-eyed folks at Bungy were a little nervous to overhaul their main revenue stream, but there was strong confidence that our work would significantly increase sales. Our key target was to increase revenue. We worked with AJH to create a digital strategy, aiming to crack that target by increasing both conversion and average spend. We built excitement through visuals and video, gave more definition to product USP's, created several paths to book, elevated combos and deals, and designed a custom booking process with baked-in upselling for combos, deals and photo & video. We also nailed 2nd tier KPIs such as helping to smooth out busy periods by incentivising advance bookings, and providing better clarity around transport options to free up the call centre. We worked through a rigorous pre-launch testing program with AJH's reservations and SEO partners, split testing the old site against the new one until the conversion rate was given the green light. Since launch in Q4 of 2017, the conversion rate on the site has increased significantly above the targets from the old site. We are now underway with a second phase of enhancements for sales and bookings, plus some exciting new content for the new year.